His banner over you is LOVE, not all the many words you might think are written there: failure, lazy, fat, disappointment . . . you fill in the blank. 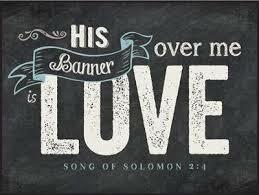 His banner over you is LOVE and always will be LOVE. Think on that.